Hey everyone! 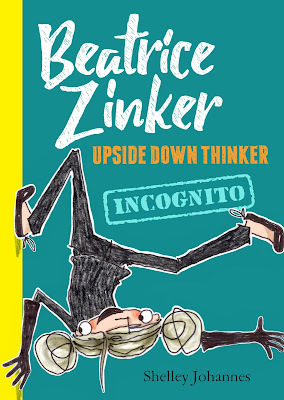 We are super excited to announce the schedule for the BEATRICE ZINKER UPSIDE DOWN THINKER INCOGNITO by Shelley Johannes Blog Tour which begins on Monday, October 1st! The tour runs from October 1st-5th & 8th-12th, will have one stop per day, and will consist of reviews & excerpts! In book two of the Beatrice Zinker series, Operation Upside is finally in full swing! But when Beatrice's over-enthusiasm lands Mrs. Tamarack with a Strictest Certificate, the team has to scale back a bit. Lying low is not exactly Beatrice's strong suit, especially when she sees someone who desperately needs to be recognized. But when the certificate meant for him falls into the wrong hands, Beatrice and Lenny have to find a way to widen their circle once again to save Operation Upside, and themselves, from trouble.